If you have lost one or more permanent teeth to an injury or periodontal disease, there are several teeth replacement options that you can consider. In the past, the choices were more limited – basically, you could either go with a denture or bridge. 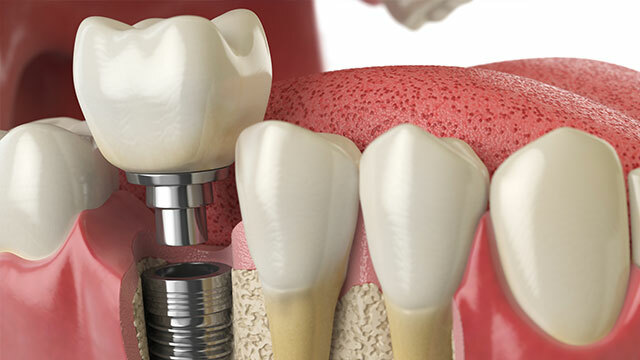 Thanks to vast improvements in dental technology and sciences, dental implants have emerged as one of the most advanced and innovative solutions for treating tooth loss. Today, many people who used to live with wobbly dentures or bridges to replace their missing teeth have found dental implants a life changing experience! That’s because dental implants are a true teeth replacement option in that they feel and function like real teeth. They make a great alternative to removable dentures, which have been known to interfere with a patient’s social lifestyle or oral hygiene habits. With dental implants, you can eat, drink, brush, floss and basically perform whatever function you used to with your own natural teeth. They are more secure and longer lasting. No longer do you fear that they might slip off because unlike removable dentures, they are permanently bonded to your jaw. With adequate care and dental hygiene, dental implants can last for many years. At LT Dental, we know that deciding on a dental implant treatment involves asking many questions – and we hope to answer them for you. Although we provide a range of dental implant options, we first want to hear from you about your reasons for considering the treatment. We want to make sure that no matter what decision you finally make, that it would be the best solution that meets your specific needs and tooth loss condition. If you wish to get a clearer picture of what dental implants can do for you and how it can improve your particular situation, talk to one of our friendly staff to set up an initial consultation today. Simply fill out our contact form and we’ll contact you quickly to book your free consultation. Or, if you’d prefer to talk, please call us on (08) 9328 5027.